I was recently asked if the Size & Position Window in Visio can display fractions of inches as fractions rather than as decimals. Well, most people are aware than you can type fractions into the Size & Position Window, but it is immediately translated into decimals, and I cannot find any way to keep the display as fractions, however you can link Shape Data (nee Custom Properties) to the width and height. In the image below, I have added two Shape Data rows (Prop.Width and Prop.Height) and I have linked the values of the rows to the shape’s Width and Heights with the formulae =SETATREF(Width) and =SETATREF(Height). These formulae mean that any values typed into the Shape Data Window are immediately re-directed to the shape’s Width and Height cells, and the format picture ="# ##/## u" ensures that the values are displayed as fractions. 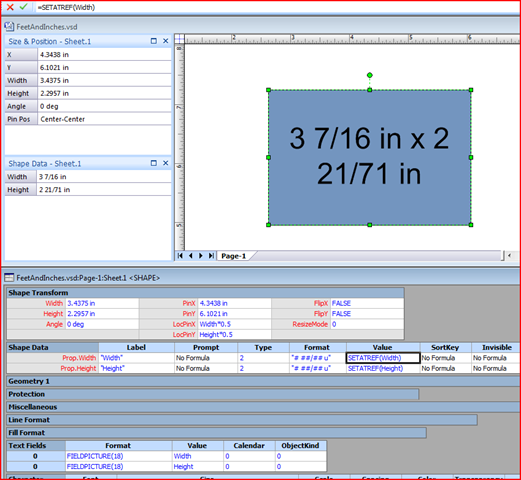 Moreover, values can be typed into either the Size & Position Window or the Shape Data Window. In the above example, I also chose to display the Width and Height values in the text of the shape using the FIELDPICTURE(18), which displays the result as fractions. P.S. I’m old enough to remember Feet and Inches being called Imperial Units … it’s a sign of the times that they are now called US Units!